Magma is called lava when it reaches the surface. 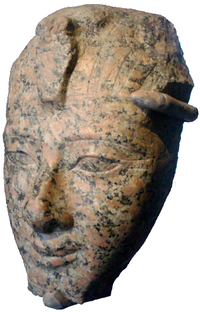 Head of Amenhotep II in granite. Brooklyn Museum. Igneous rock is one of the three main rock types, the others being sedimentary and metamorphic rock. Igneous rocks are rocks formed from molten magma. The material is made liquid by the heat inside the Earth's mantle. When magma comes out onto the surface of the Earth, it is called lava. Lava cools down to form rocks such as tuff and basalt. Intrusive rocks are made when the magma slowly cools to form rocks under the surface. Granite is one of these. The upper 16 km (10 miles) of the Earth's crust is composed of about 95% igneous rocks with only a thin, widespread covering of sedimentary and metamorphic rocks. Igneous rock occurs in two ways. Igneous rock formed from magma that has become solid inside the earth is called intrusive igneous rock. Examples of intrusive igneous rock types are gabbro, diorite, and granite. Igneous rock formed from lava that has become solid on the outside of the Earth is called extrusive igneous rock. This can happen because of the eruption of a volcano. Some extrusive igneous rock types are basalt, andesite, rhyolite, tuff, obsidian, and pumice. Magma is a complex high-temperature fluid substance. Temperatures of most magmas are in the range 700 °C to 1300 °C. Magma can get forced into adjacent rocks (intrusion or plutonic), or forced out to the surface (extrusion or volcanic) as lava, or blown out in exposions which include rock pieces (tephra). Magma is made up of atoms and molecules of melted minerals. When magma cools the atoms and molecules rearrange to form mineral grains. Rock forms when mineral grains (often crystals) grow together. Granite, diorite, gabbro and basalt are a few types of igneous rock. Quartz is one of the chief minerals produced by igneous action; it is made of silica (SiO2), the most common molecule in igneous minerals. Some examples of igneous volcanic rock are pumice, obsidian (volcanic glass), and scoria and much more. Mafic: a silicate mineral or igneous rock which is rich in magnesium and iron. Felsic: silicate minerals, magma, and igneous rocks which are rich in the lighter elements such as silicon, oxygen, aluminium, sodium, and potassium. The first six minerals in the list are silicates. Oxides are mostly of iron. ↑ Smith P. 1900. Volcanoes: a planetary perspective. Oxford. This page was last changed on 4 July 2018, at 08:16.